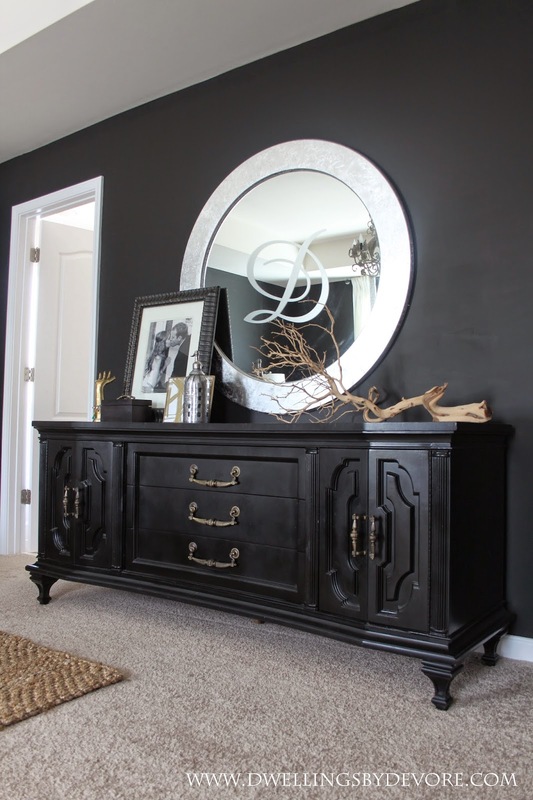 Dwellings By DeVore: Fall in Love Room Reveal! I hope you guys had a wonderful weekend and a great Halloween! We kept things pretty low key and just went to a few houses in our neighborhood. Our daughter had a blast and of course ate way too much candy. 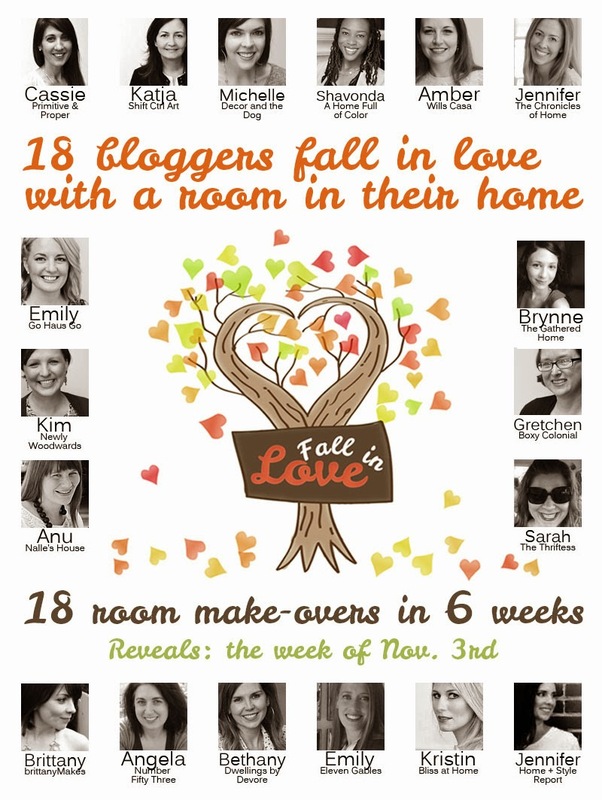 I'm so excited to be sharing our Master Bedroom with you today as a part of the Fall in Love Room Challenge. I wasn't sure I was going to get it all finished in time, but then again I have a bad habit of waiting until the last minute to get things done. I tell myself I work better under pressure, but then I freak out a little at the last minute. It's a vicious cycle. Anyway, on to the room reveal. I started by painting the walls black. The color is actually Ralph Lauren Black Basalt. I was nervous about how it would turn out, but I am so thrilled with the results. I thought it might feel dark and dungeon like, but I kept the furniture/bedding light to help balance things out. It doesn't make it feel small at all and some people have even said they think it looks bigger. Here's a little before picture of what the room looked like when we started. And here's what it looks like now! I'll mainly just be sharing all the pictures in this post along with a few sources. I have a few DIYs that I'll talk about in some upcoming posts in the next few weeks. Our big splurge for this room was the bed. We've wanted to get a king size bed for the longest time. My husband is kind of a buy guy and although he'll deny it, he likes to sprawl out. So a king size bed seemed like a good idea. Almost all of the furniture in our house is from Craigslist, thrift stores, or family members. So it was actually really nice to buy something new and not have to do anything to it. We are really happy with it and hope to have it for many years to come. For us, it was definitely worth the investment! 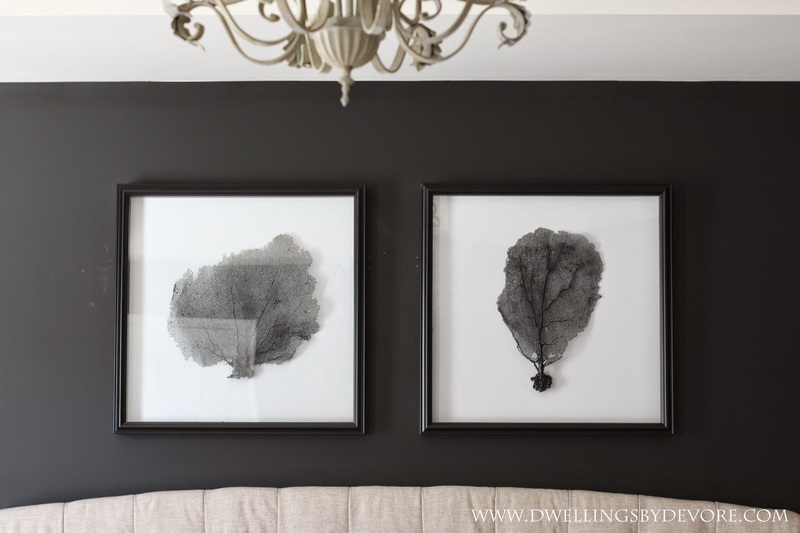 The sea fan artwork was a simple DIY project that I'll be sharing soon. We moved our jute rug up from our living room. It was shedding all over the wood floor and was driving me crazy. I love how it looks in here though. Now I just need to find a rug for the living room! 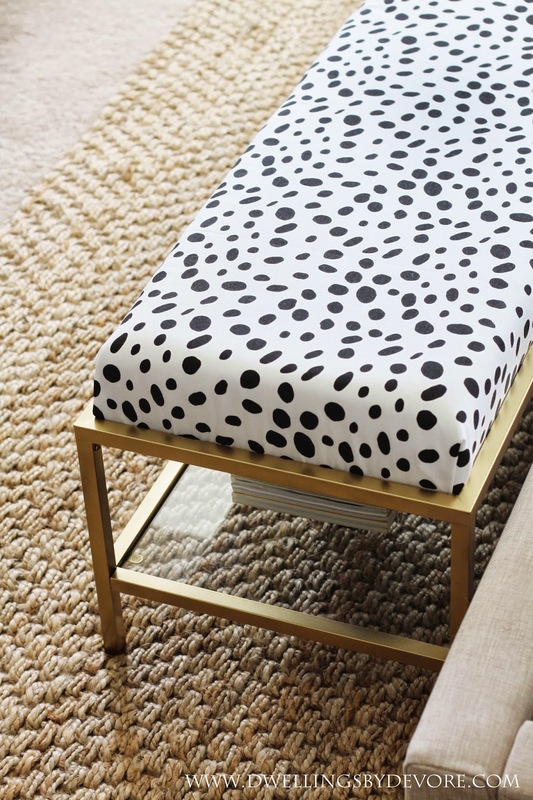 I've been wanting to incorporate this velvet leopard fabric into our home and this seemed like the perfect spot for it. 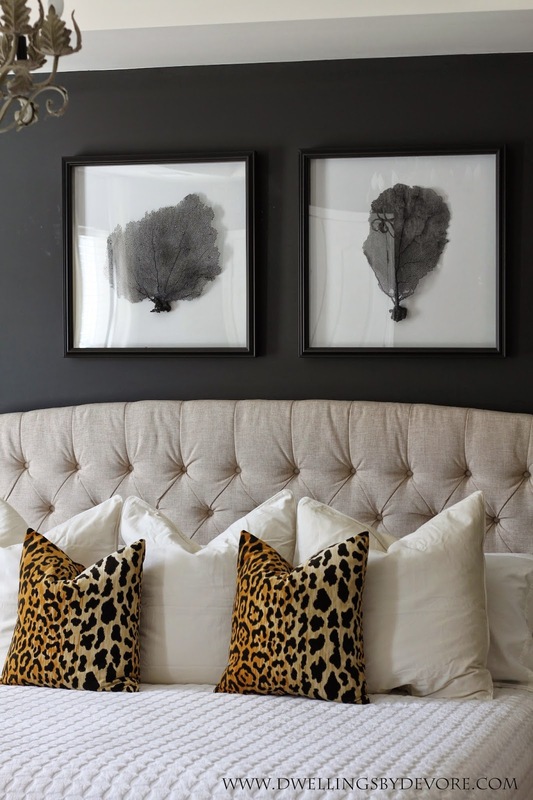 I think every room needs a little animal print! 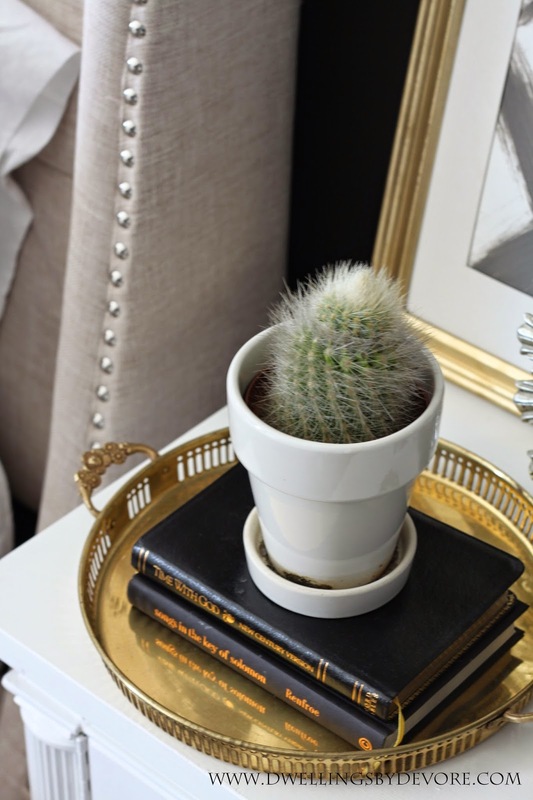 This bench was another fun DIY I did for this room. I'll be sharing the details on it soon too! I hope you enjoyed a little peek into our home. Thanks again to Cassie from Primitive and Proper for hosting this and giving me the motivation I needed to finish this room! Check out the list below for the other participants' posts today and then follow along the rest of the week to see all of the rooms revealed. Bravo! So well done! It is such a cozy room with so much style. Love it my friend! OHMYLAWD i love it!!!!!!! 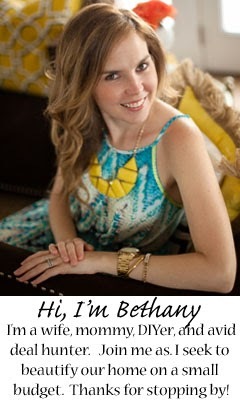 bethany, it's stunning! can you come do my bedroom next!!!! Gorgeous. 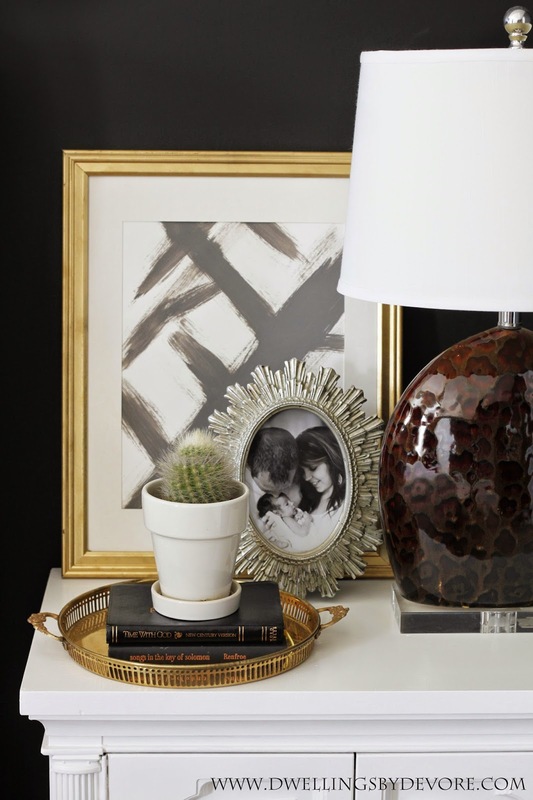 I love the dark wall and the touch of gold and leopard are perfect. OMG! Glam and fab to the max Bethany! LOVe it all and can't wait to find out how your did those sea fans! This is so gorgeous! I love the bench and the black wall. Great job, lady! This is so gorgeous! 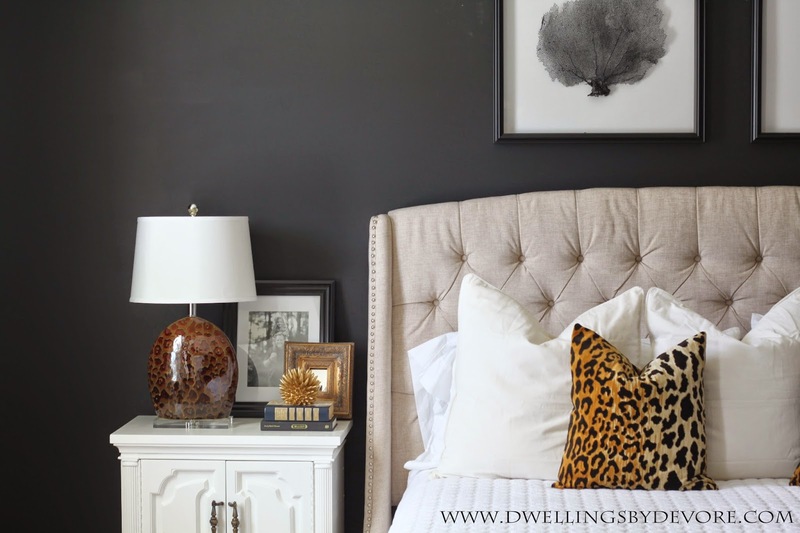 I love it all, but especially the dark walls and that touch of one of my favorite fabrics ever (the leopard)! Dreamy! Beautiful! 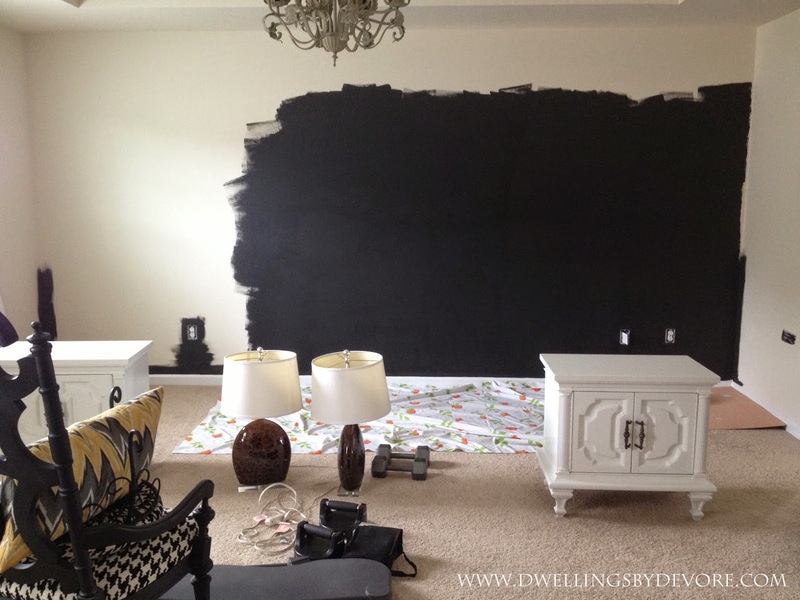 Love the dramatic, dark walls! Everything is so beautiful Bethany! I LOVE those black walls and your bench. I'm so excited for all of your upcoming tutorials! Perfect! The black looks stunning! I love that your new bedroom looks completely different than your first even though I see you still used touches of yellow from the old space. It looks incredible!!! Those black walls!! Dreamy dreamy dreamy. All of it. You've done it again, B! This is seriously gorgeous. Wow! 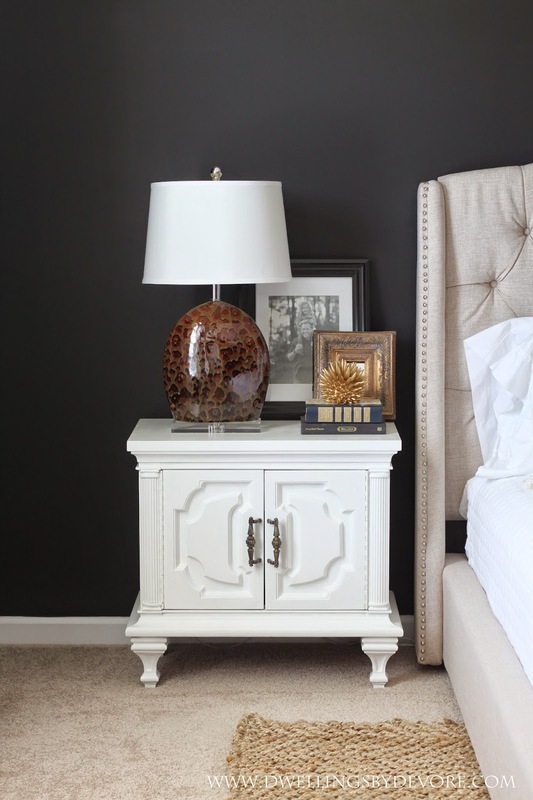 Such a transformation - and that bed is a real showstopper! I'm really loving this room! I am interested in the bench details...we need one EXACTLY like that! The wall color is so so good. And THAT bed. It's totally worth the investment. so so so pretty! We are in the market for a king bed too! I don't even know where to begin! I am SO in love with this!!! GORGEOUS! What an amazing space! Bravo my friend, hope you enjoy this beautiful space for a long time! OMG Bethany this is absolutely GORGEOUS!! Im so in love with this space. The black walls are beautiful. We got our bed from Wayfair too, it actually looks very similar to yours. It was the best money we spent. Thank you for sharing this gorgeousness with us. The black walls are just stunning! I'm dying over that bench - can't wait to hear about it! That's totally what I need for my entryway! 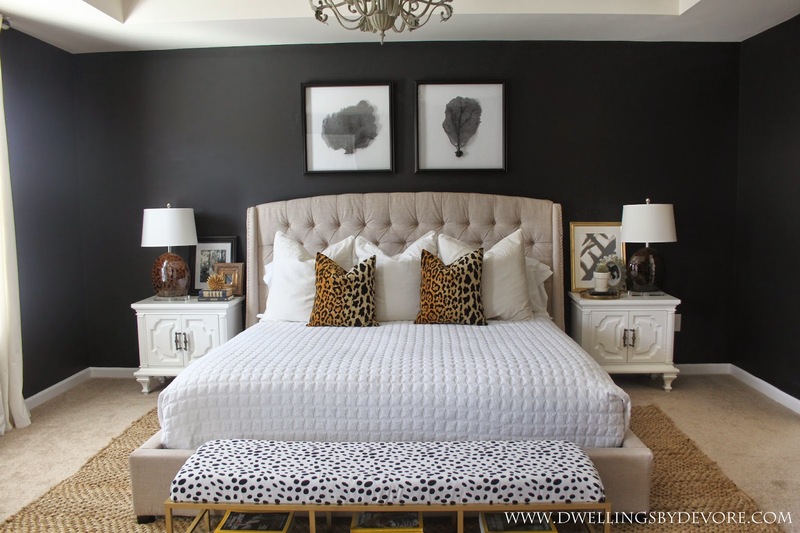 The leopard pillows are icing on the cake! Dang girl - you friggin' nailed it! The layering of textures and colors is so good. I know this is the littlest detail - but I love how you used the stacks of Nat.Geo. on your bench. 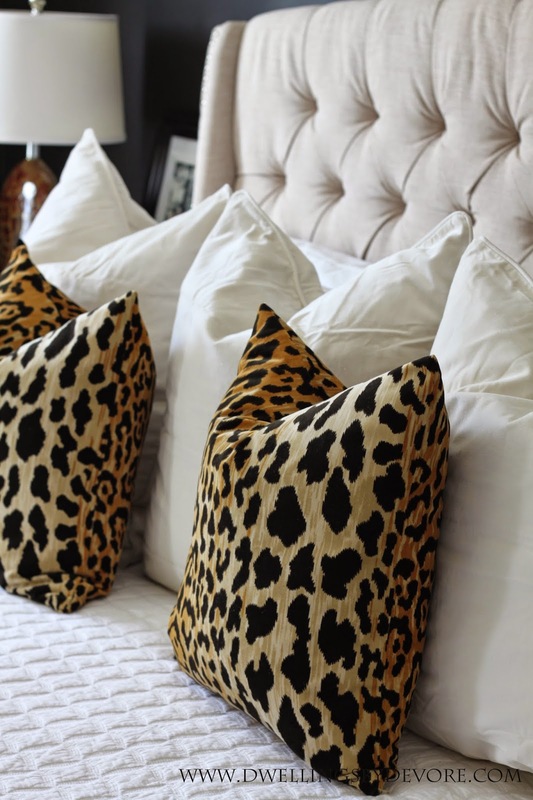 Love the little pop of gold - and how it pulls the brighter tones out of the gorgeous leopard pillows. Beautiful. 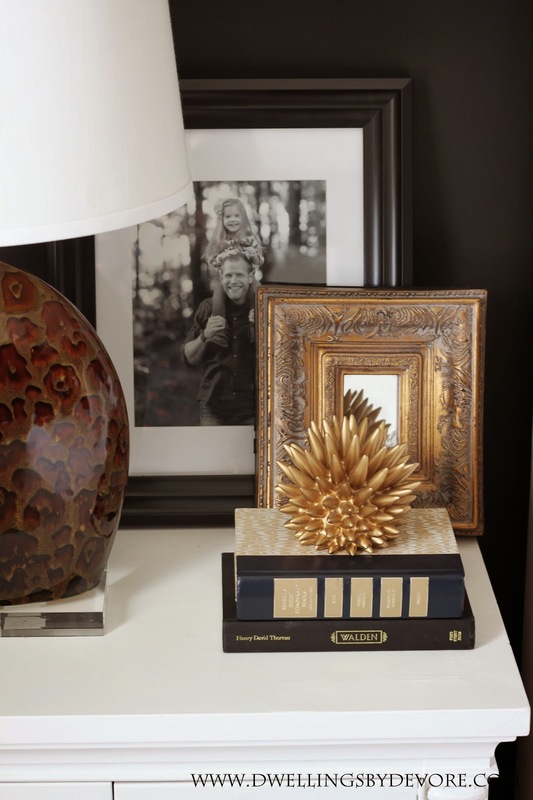 I am SO smitten with this room Bethany! I swear I've looked at it 100 times! That black blows me away with all the neutrals against it! Loving that bench too! Can't wait for the deets! It's stunning! You did a great job. 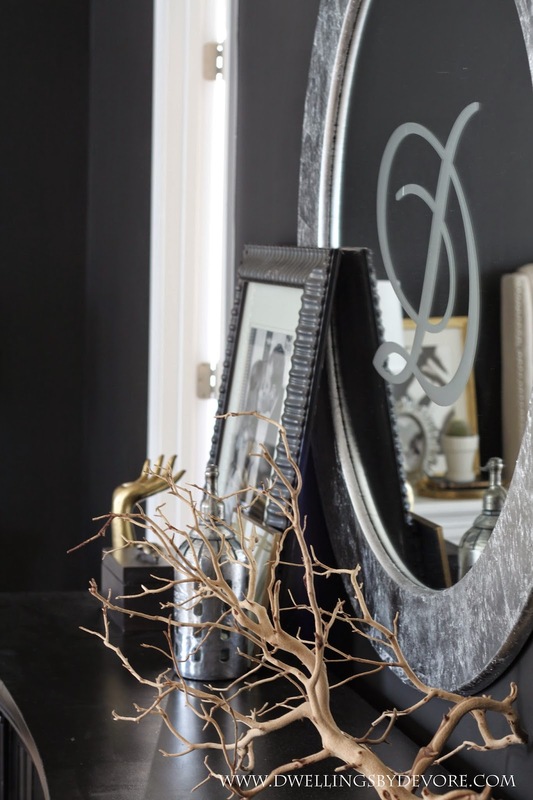 I've always been a fan of dark colors but am always intimidated when it comes to incorporating it in my own house, however, this may have given me the kick in the rear end that I needed! Bethany! You have outdone yourself!! This is unreal!!! This room is amazing! Love the dark walls. That bench is incredible! I cannot wait for that tutorial. I couldn't love that fabric more! Bethany, your room is just amazing!! Love those deliciously dark walls, your seafan artwork, and every other little detail of the space. Awesome! Thank you! That fabric is one of my favorites too! Thank you! I was definitely a little hesitant to pull the trigger on such a dark color, but I'm so glad I did! Thanks so much Summer! I'm working on the tutorial to share soon! Thank you Jenna! I've wanted to use that leopard fabric for the longest time, so glad I finally had a place for it! Hoping to share the bench tutorial soon! Thank you sweet friend! I agree, the bed is one of my most favorite purchases! Worth every penny! Thank you Krystine! We are loving it! Thank you Emily! I totally agree, it is one of my favorite purchases and totally worth it to us! Hoping we have it for many years to come! Thank you! Can't wait to share it! Thank you! I'll be sharing the bench tutorial soon! Thanks Laurie! My style has changed so much over the past few years and I'm so glad to finally get to decorate a new space without having to think about moving in the near future. Thanks Brynne! It's one of my favorites too! Thanks so much Jennifer! That leopard fabric has been a long time favorite of mine, so glad I finally pulled the trigger on it! Thank you Cassie! And thank you for the motivation to get this done! Bethany! It looks SO fantastic. The first thing my husband and I did when we bought our first house was buy a king bed and it's been a marriage happiness saver :) I absolutely love the black walls. I would have been nervous of the dungeon feel but with the white ceiling and upholstered bed frame it doesn't have that effect even a bit. So chic and glam and gorgeous. This bedroom is so beautiful! I love it! Which bed is it from wayfair? I have been looking for one from there but can't decide and I love the look of yours! LOVE! I just purchased this bed in gray and am waiting on to arrive...found your blog by looking for ways to redo my room when it comes...we have spent 9 years of marriage in a queen. So excited. Love the comforter...where did you get? Gorgeous, gorgeous room. Thank you! We have loved having a king bed so far, definitely a nice luxury :) The quilt is from Homegoods. What a beautiful room!! 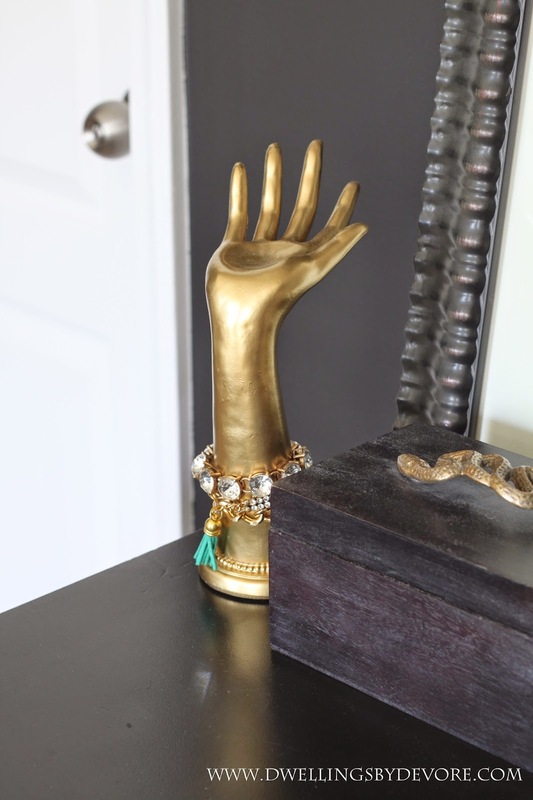 Where did you get that gold hand/arm object? Thank you! Thank you so much! I found it at Hobby Lobby in the clearance section a while back and spray painted it gold. They may still have them, but I'm not sure. I've heard they have similar ones at Michael's too if you happen to have one near you. When will you share the details on the bench? 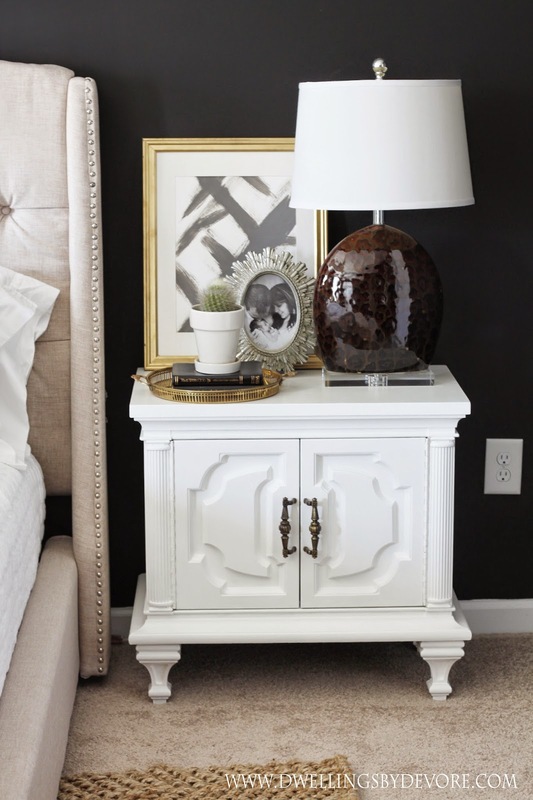 I'm trying to find something to go in front of my king sized bed and I love this! Thanks. The link to the bed does not work, do you remember the color and brand of the bed? I am just dying to know where you found your quilt! I have been looking for a simple white quilt with some texture, and this one is just perfect! Also, this bedroom is pure perfection. Thanks so much! The quilt is from Homegoods. I've seen them there still from time to time. where did you find the bench?? Thanks so much! I think they are around 19" by 19"
I actually used a little bit larger inserts, that makes them look a little fuller. I used the 20 x 20 feather inserts from IKEA. They are my go to for inserts.